Bookroo: Why This Children's Librarian Thinks This is the Best Children's Book Subscription! Thinking about trying out a children’s book subscription but not sure which one to sign up for? I’ve tried several and Bookroo is my favorite monthly book subscription for kids. Here’s why I think it’s the best! Over the past couple of years, as children’s book subscriptions have become more popular, I’ve tried out quite a few of them and Bookroo is always the one I come back too. 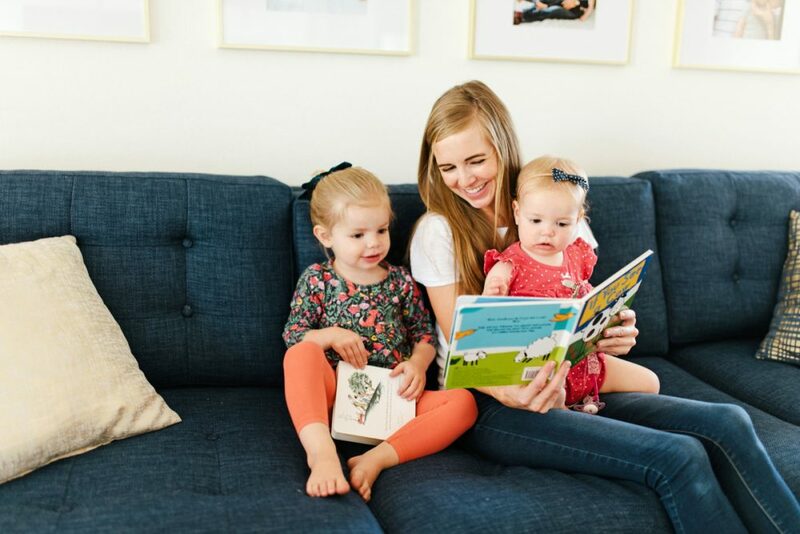 I’ve partnered with Bookroo on some Instagram posts over the past few years, but this post isn’t sponsored – I just wanted to have all of my thoughts about their monthly children’s book subscription and why it’s my favorite kids book subscription all in one place, since it’s a question I get asked fairly frequently. The most important part of any children’s book of the month club type program is GOOD BOOKS. And I think Bookroo does a phenomenal job choosing interesting titles. They mix new titles with backlist titles and I’m amazed at how often when the books arrive, they are books I’m not familiar with at all! Or they send books that I haven’t seen in years and remember from my own childhood (like a recent box that included The Last of the Really Great Whangdoodles). They also do an excellent job sending books that are seasonal without being so specific that you feel weird reading them all year long. My girls LOVE the fact that each book comes wrapped individually (and I’m always a little blown away by how high-quality their wrapping paper is and what fun patterns they choose that coordinate with each other and sometimes even the books and season!). It really makes it feel special. I’ve also seen other really good children’s book subscriptions, but so many of them include little goodies or toys or snacks along with them, and I don’t love that. I want my children to be excited about the BOOKS themselves, not distracted by little cheap doo-dads and I don’t want a bunch of little toys showing up every month that I have to figure out how to store or not lose. So the fact that Bookroo is solely focused on sending the best books for my children is a huge selling point for me. I also appreciate that they include a little card that gives an overview of the books, suggest things to chat about after you’ve read the book and they even have interviews with the authors on their blog each month. 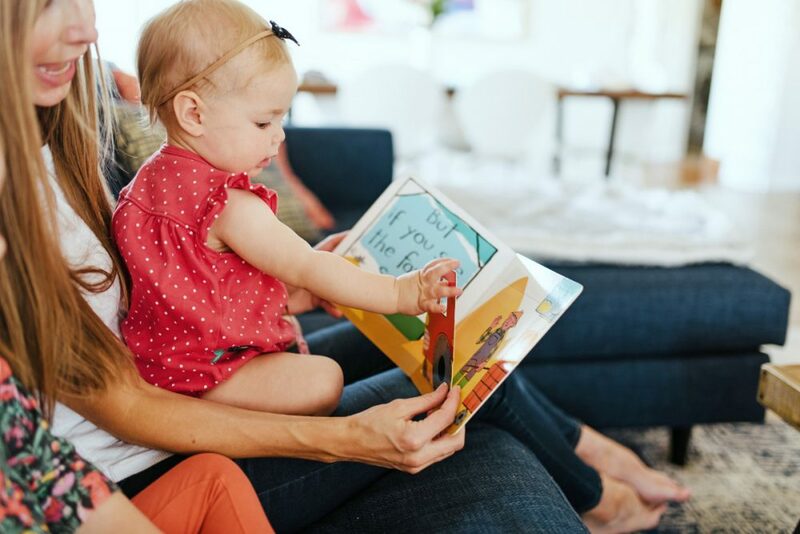 The board book and picture book subscriptions also have extension activities that you can do alongside the book – there is a link to them on the included card each month. What ages is Bookroo’s kids book subscription for? Their children’s book subscription has three options. You can do the board book version, which has three board books in each monthly box. There is a picture book option, which has two picture books each month. And there is a chapter book box (intended for children between about 7-10) that comes with two chapter books each month. We’ve gotten every variety and I’ve been impressed with every single one (although I have a special love for the Chapter Book box because it feels like it’s saving my life each month when Ella gets two new books – keeping her in books is pretty much a full-time job). Is a monthly children’s book subscription for you? I will say that if your number one priority is adding the books YOU choose and most want to your home library, a children’s book subscription is probably not for you. For me, the fun of a monthly children’s book subscription is being surprised by new titles and picks I might not have discovered on my own and mixing them in with the titles I DO choose myself. I love the novelty of new books arriving in our mailbox each month and discovering new titles and authors alongside my children. The other thing I love about Bookroo’s monthly book subscription is that if they send you a book you already have, you can give the book to someone else (your school library, a teacher, as a birthday gift), snap a photo and send that photo to Bookroo and they’ll give you $5 off your next subscription. Although in more than a year of getting their kids book subscription, I think we’ve only gotten one book we already owned – they really are MASTERS at choosing hidden gems. They also have a nifty option where if you have children of multiple ages, you can sign up for an alternating subscription so one month you get a board book box and the next you get a picture book box. Or, if you’d rather, you can sign up for two subscriptions and get 15% off the second subscription. I think a children’s book subscription is fun year-round, but it’s especially fun in the summer when school is out and the days are longer with more lazy afternoons for reading books together. Sometimes, I save our Bookroo books for a week or two until a trip and take them along so they’re new and exciting as we spend hours in the car. Often, I end up reading the chapter books that Ella gets in her box aloud to Ani once Ella finishes them on her own. And a subscription makes a fantastic gift (way better than a toy that gets forgotten in approximately ten minutes), especially if you’re looking for something to give to a grandchild or niece or nephew. I could go on and on about why I love Bookroo, but seeing as how this is already a 1000 word post . . . you probably don’t need to read more. You can also use the code BOOKS2LOVE for 15% off any of their children’s book subscriptions, which makes it an even better deal! If you have questions about Bookroo, though, I’m happy to try to answer!